Well over 60% of fixed-rate municipal bonds issued today are callable prior to maturity and most come with high premium coupons. Despite the fact that these bonds are likely to be refunded prior to their first call date, traditional bond solution software completely ignores this in the calculation of debt service and so-called True Interest Cost (TIC). 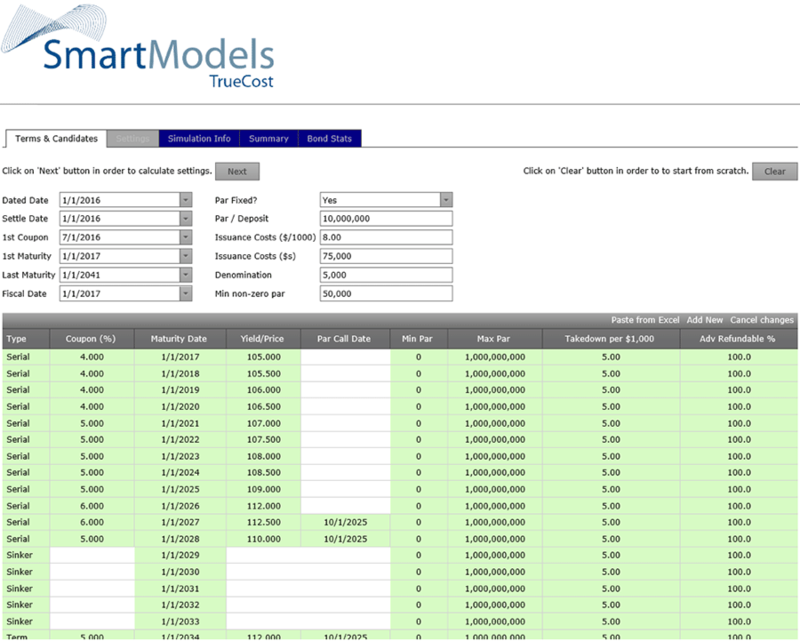 SmartModels™ True Cost Solutions is the only bond structuring and solution software that uses the issuer’s actual refunding criteria to determine first refunding adjusted debt service (RADS), and ultimately the issuer’s true capital cost, Refunding Adjusted Yield (RAY). Takes all possible coupon-bond structures – different coupons, call features. Provides an optimal solution with the lowest issue-level RAY. Determines RAY per bond to facilitate comparison. Can use either debt service to maturity or RADS in solution. Utilizes the issuer’s specific refunding criteria in all calculations, in a simple dropdown interface. More accurate; determine expected debt service and lifetime cost of capital. If you want to understand the real-world cost of capital for you or your clients and up the game in municipal bond structuring, get True Cost Solutions.